Customize your Shoredocker shore dock kit to suit your specific application. Add length to your Shoredocker 1200 or Pontoon roller ramp shore dock. 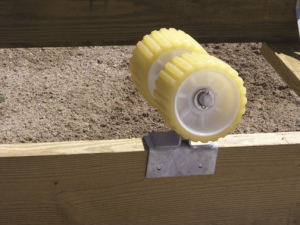 The extra roller set includes 2 rollers with brackets and fasteners. Add length to your Shoredocker 2000 roller ramp shore dock. The extra roller set includes 2 double-roller axles with tiltable axles, 4 rollers, brackets and fasteners. Add these kits when making your ramp longer than the standard Shoredocker 1200, 2000 or Pontoon kits. The braces are used for strengthening rail beams to cross members. Includes 2 side braces and hardware.